(Nanowerk News) How do you imagine the interior of our cells? Often compared to tiny factories, cells found smart and sophisticated ways to organize their ‘interior’. Most biological processes require cells to bring together their ‘employees’, such as proteins and nucleic acids (like DNA), at the right time. Scientists at the Center for Soft and Living Matter, within the Institute for Basic Science (IBS, South Korea), have explained how liquid-like droplets made of proteins and DNA form in vitro. Currently, there is a huge interest in understanding the molecular mechanisms behind the creation of such droplets, as it is linked to some human diseases, such as amyotrophic lateral sclerosis (ALS). 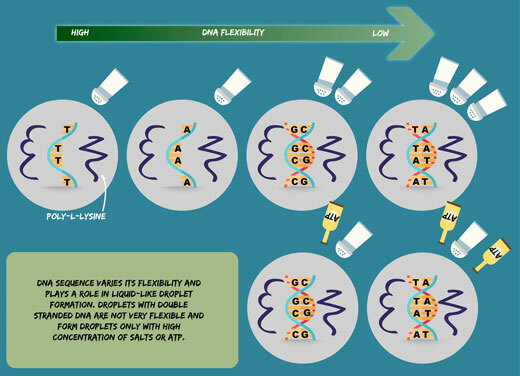 The results, published as a featured article in Biophysical Journal ("DNA local-flexibility-dependent assembly of phase-separated liquid droplets"), showed how much the sequence of DNA matters in the formation of such droplets. 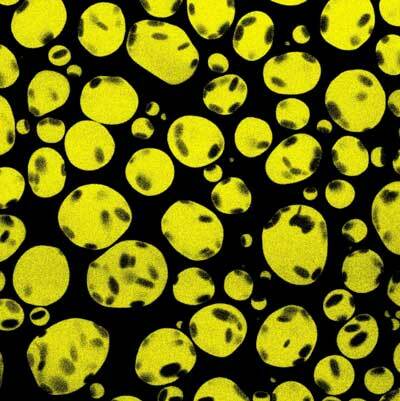 Figure 1: Fluorescent microscopy image of liquid-like droplets (yellow) formed of poly-L-lysine, DNA (dark spots), and adenosine triphosphate.